As we originally noted and has been mentioned by a number of electronic image experts, one of the most glaring details demonstrating Obama’s purported birth certificate is a fraud is the presence of digital artifacts. Digital images often contain unwanted information known as artifacts. In the blow up below of Obama’s supposed birth certificate, we can see digital artifacts as areas of white outlining text and graphical elements on the page. I brought a capture of the original PDF into Photoshop and enlarged it and increased the contrast in order to show the artifacts. Artifacts are created as the result of lossy compression techniques. So-called “lossy” compression is a data encoding method which compresses data by discarding or losing some of it in order to reduce image file size. Alternately, the white areas may be the result of a sloppy effort to eliminate a white background on the scanned image of the certificate and drop it over the green textured background. In Photoshop and similar image editing programs, it is possible to select areas based on color or contrast and eliminate those areas and make them transparent so a background image shows through. The process is far from perfect, especially when attempted by an inexperienced Photoshop user. It can leave behind telltale artifacts or jagged areas of original pixels, in this case white pixels from the original background. As a long time user of Photoshop and Illustrator, I believe the second explanation is the likely reason there are white areas around the text and lines. It is a sloppy effort to eliminate a background. As previously noted, the document is problematic in other ways. There are obvious text font inconsistencies, most notably in regard to the date in the “Date Accepted by Local Reg.” field near the bottom of the document. The number “1” in the year “1961” is darker than the rest of the date. The letter “e” at the end of “none” in the “Type of Occupation Outside Home During Pregnancy” is also darker and slightly slanted, which is different than the same letter elsewhere in the document, indicating it was either added later with a typewriter of computer. This letter is included in one of the layers when the PDF is imported into Adobe Illustrator. The date and state registrar stamps at the bottom of the document also break out in separate layers, indicating they were likely added and are not part of an original document as one would expect of an official document. 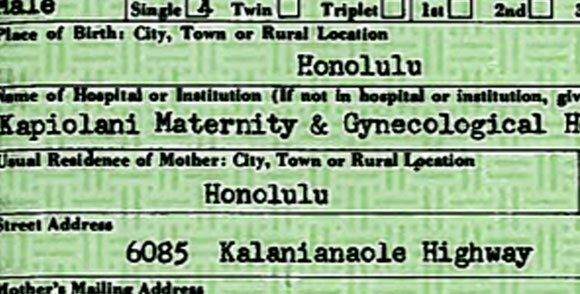 Other oddities add to the mystery of the document, including “X” marks above the “Twin” and “Triplet” in “This Birth” box. As far as we know, Obama is not a twin or triplet. Finally, the document does not contain an official imprint seal, as we see on other certificate of live birth documents (see the example from an article we posted yesterday). Although intended to be sarcastic commentary on the “birthers,” BuzzFeed has a list of most of the document’s anomalies. Now that we have established that the document is an obvious forgery, we should ask why Obama’s people would release as definitive proof of his citizenship such an easily debunked fraud. Is it possible Obama’s people are so incompetent and lazy as to release a document that was torn apart soon after it was released by people who know what to look for? Or was this obvious fraud released simply to keep the debate and the political circus sideshow going? While Obama’s birth issue has serious constitutional implications, it is to a certain degree a distraction. It reiterates the false right-left paradigm – as the PPP poll indicates — and deflects from larger political issues such as the Fed Reserve, the fraudulent monetary system, and ongoing wars responsible for killing more than a million people over the last eight years. It also pumps new life into the so-called birther movement, a favorite target of derision by Obama supporters, especially in the corporate media (most notably by Chris Matthews). The birther movement worked like a charm in exaggerating the right-left paradigm and distracting from more important issues.